This past weekend, I took Marcus out for an early birthday celebration at Sushi Yasuda over in Midtown East. I myself have been here a couple times back in 2009-2010, but Marcus had never been there before so we thought it was one of those things he needed to cross off his gastronomic bucket list and compare it to the times we went to 15 East and Jewel Bako together. Sushi Yasuda is the famed house of sushi lead by the master chef, Naomichi Yasuda, who from December 1999 (when the restaurant first opened its doors) to 2006 never missed a single seating. Since then, Chef Yasuda has trained two of his now disciples, Chef Tatusya Sekiguchi and Chef Mitsuru Tamura to follow in his footsteps, as he returned to Japan "to open a small neighborhood sushi shop and embark on a well-earned semi-retirement." 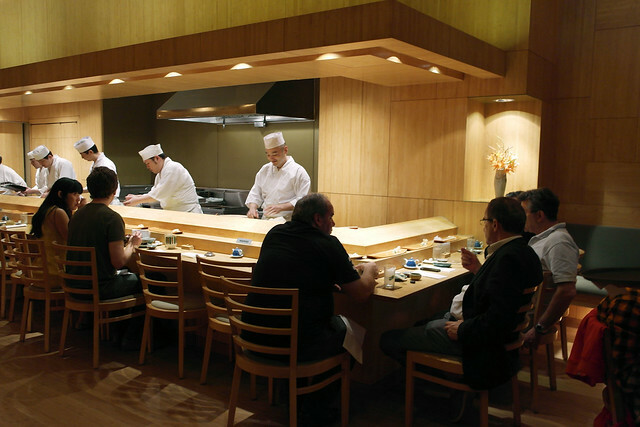 Sushi Yasuda has a generous amount of seating at its sushi counter (relatively speaking) with sixteen in total. 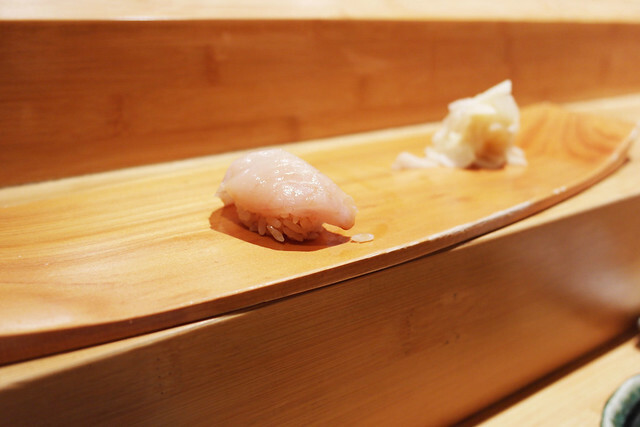 The floors, walls, ceiling, tables, and sushi bar are composed of solid bamboo planks. The interior of the restaurant is airy as "a haven from the noise and grit of the city outside." While there isn't any music played inside the restaurant, "the lighting, which is brighter than one might expect, is designed to provide visual clarity on the sushi -- both its preparation and presentation." Starting out with some hot, house green tea as well as a small plate of Japanese vegetables, we were ready for what the sushi chef had lined up for us under his sushi omakase selections, a decision that we give to the sushi chef by requesting omakase in the first place as it translates to "You decide" in Japanese. We were also given a yubifuki (i.e., a finger-cloth made of sarashi-fine Japanese bleached cotton) for cleaning our fingers while eating sushi with our hands. The proper way to eat sushi is to carefully pick up each piece of sushi with a finger and thumb and place the entire piece in your mouth to eat, with the rice side on our tongues for the best intersection of flavors, textures, and aromas." I read up on the traditions to which the restaurant holds itself true, and I thought it'd be interesting to share them. Chefs Sekiguchi and Tamura select fish varieties one by one, from all around the world (though much from Japan) including local and regional ones, "evaluating each for freshness, size, and its spirit or energy." Shortly there after, "the comprehensive process of cleaning, preparing, and storing" begins, as Japanese cedar-wood line many of the boxes and different varieties are stored in separate ones. In addition to all this, the chefs "carefully control the aging process of the fish -- an essential part of making sushi -- as "'just-caught' fish is not always ideal for being eaten immediately as sushi and different fish require different methods of refrigeration and storage for ideal preservation and taste." In addition to sourcing the quality varieties of fish, one of the "most complex and difficult parts of making sushi is perfecting the rice." Sushi Yasuda uses a mix of Japanese short and medium-grain rice, combined with Japanese red and white rice vinegars, Japanese sea salt, and a small amount of sugar, and the water used to cook the rice has been purified with bincho-tan (i..e, Japanese charcoal). 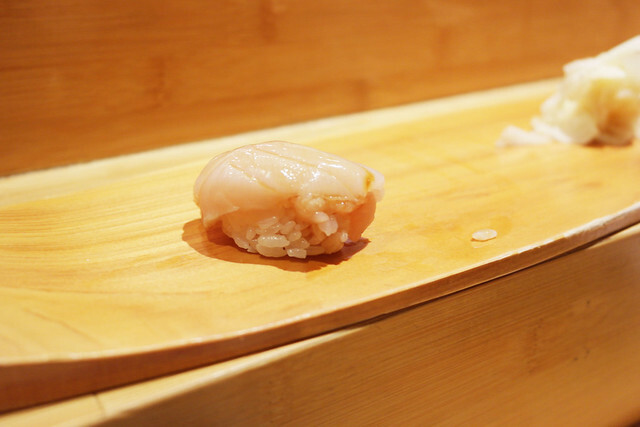 The rice itself is cooked in precise proportions at calculated temperatures for a specific time, a method that Chefs Sekiguchi and Tamura have "refined after years of research and experimentation, using their hands as instruments to evaluate how moist the rice is before cooking it and adjusting the amount of water accordingly." 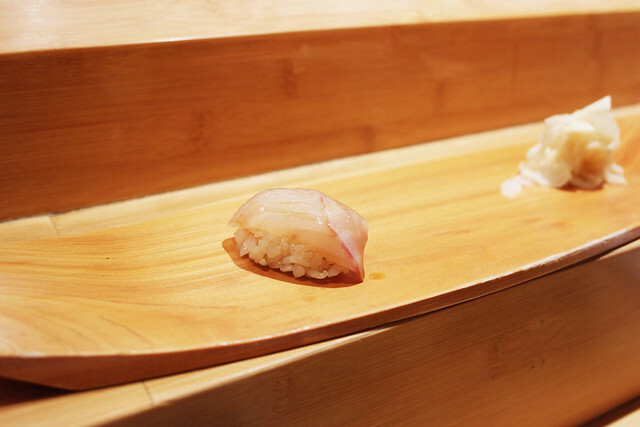 Each piece of nigiri-sushi has a "delicate topping, usually a sheer coating of Yasuda's special shoyu (i.e., soy sauce) applied by the sushi chef." 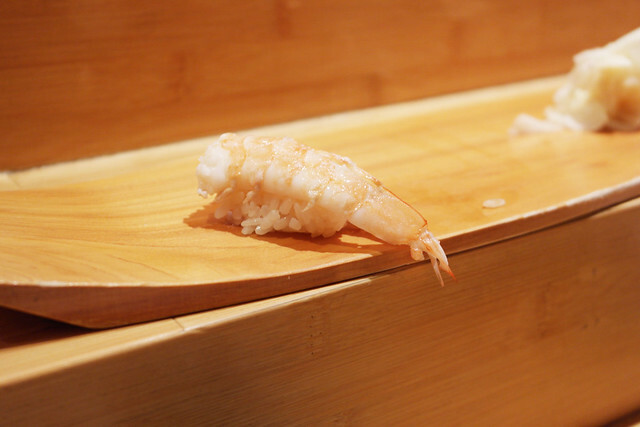 As such, it is best to eat the sushi "straight" without adding extra shoyu. Garnishes include freshly "ground wasabi (i.e., mountain-grown Japanese horseradish) and gari (pickled ginger that is sharp and slightly sweet and is used for palate cleansing)," both of which are intended to be used in moderation. 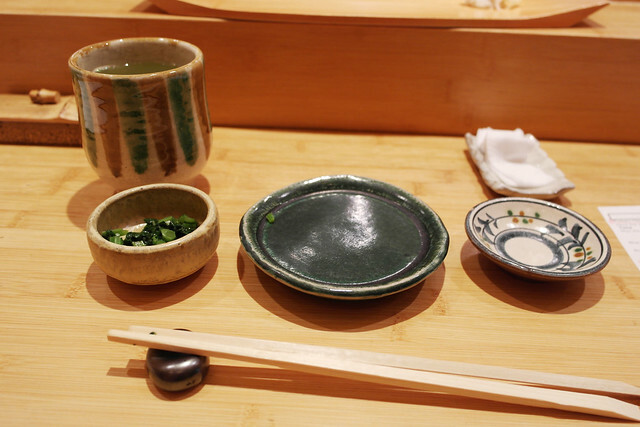 Additionally, the restaurant advises that one should avoid mixing the wasbi in the shoyu, therefor allowing the distinct flavors of the fish, rice, and condiments to "meet each other" rather than blend together. 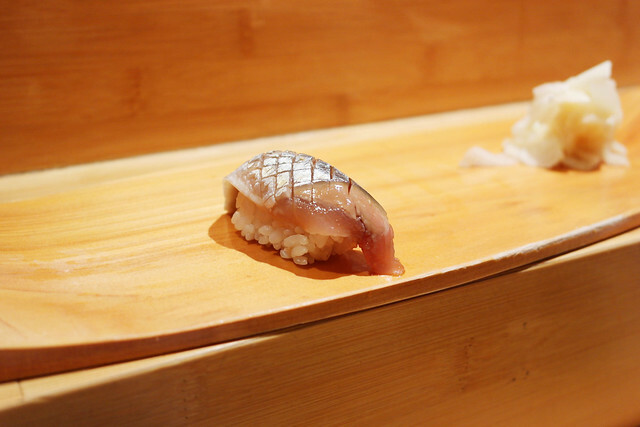 Our first piece was bonito, a variety of fish that falls within the tuna family. I had never had this as sushi before so it was interesting to experience it here at Sushi Yasuda. It had a well-balanced marbled texture, creating a very melty sensation while still having some meatiness to it. Great starter to the omakase, and I knew Marcus would be in for a wild ride -- one that would could quite possibly rank Yasuda as his favorite sushi spot in the city. Next up was the branzino of the white fish family which had a chilled, tile-y texture to it. Very nice! This was the sockeye salmon, which was simply divine. Just as I described the Alaskan king salmon at Sushi Dojo, the sockeye was guum, a Cantonese word that doesn't really have a direct translation, but comes closest to meaning gold, savory, and rich. So good -- what a gorgeous piece of fish! This was kanpachi, a variety of yellowtail, which I thought was just okay -- nothing special really to report about it except nice quality and cut. Our fifth piece made up for the the previous miss -- this hotate (scallop) was both melty and tile-y without that unfavorable sliminess that can happen with scallops. It was the ideal thickness, too. Ah so great. This was the blue fin tuna, which is probably my least favorite variety of raw fish (not counting toro -- fatty tuna). 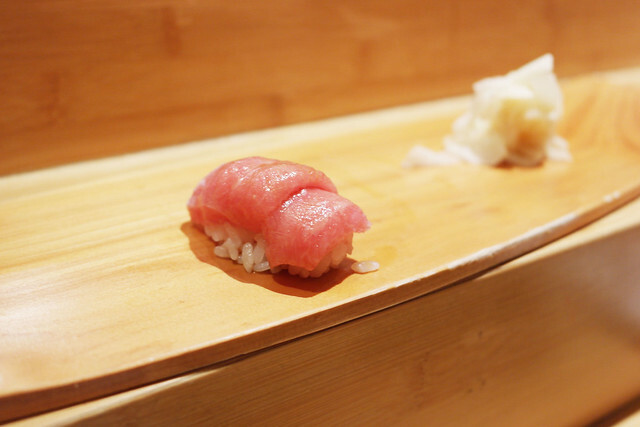 However, Sushi Yasuda surprised me big time, by showing me the untapped potential of akami (lean tuna). I had no idea that a fish this lean could be silky. Major hat tips to the sushi chefs at Yasuda! 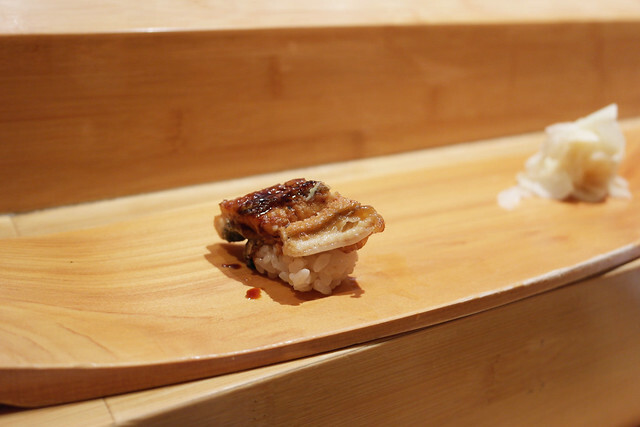 One of the signature things that one must have at Sushi Yasuda is its notable varieties of eel. The first eel we had was the unagi (fresh water eel) drizzled lightly with kabayaki sauce and grilled to soft and flaky perfection. Boneless and warm right off the grill, the unagi at Sushi Yasuda is unlike any others I've had in this city -- I imagine it's as close to the traditional preparation in Japan as it can be because it's so damn good. Marcus made sure to mention to our sushi chef that he doesn't have a particular affinity for uni (sea urchin roe), so he skipped this next one, while I enjoyed the glorious golden lobes from California. It was incredibly fresh (as if straight out of a recently cracked open echinoderm) as well as the expected meltiness yet a surprising rounded minerality to it. I can see why Lisa loves the uni here -- it's rich and buttery in all of the best ways. I wish I had requested for another bite! Following the uni, we both were given sanma (pike fish). 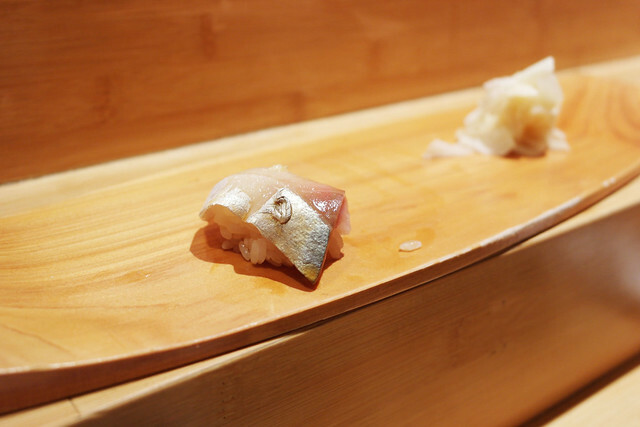 Expected in a variety from the mackerel family (you can tell from the iridiscent skin), the sanma had a strong fishiness to it but had quite an interesting, subdued finish. Soon after, we had the ocean trout from Iceland which falls in the salmon-trout family. Just like with the sockeye salmon, this may have been even more guum comparatively -- delectably milky, rich, and savory. As you can tell by its marbled pink color, this was the blue fin toro. 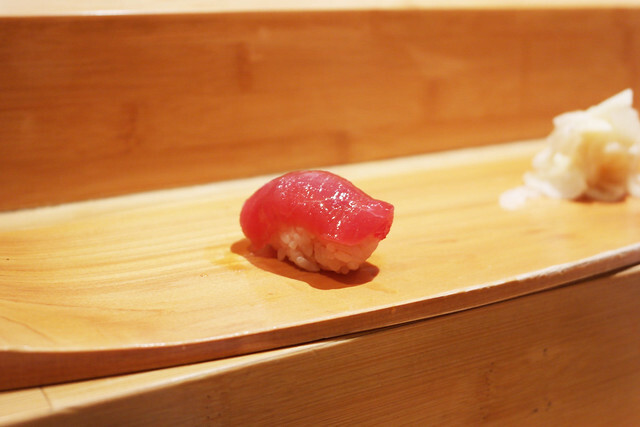 Fittingly, toro, the word used to describe fatty tuna, means "melting" in Japanese. 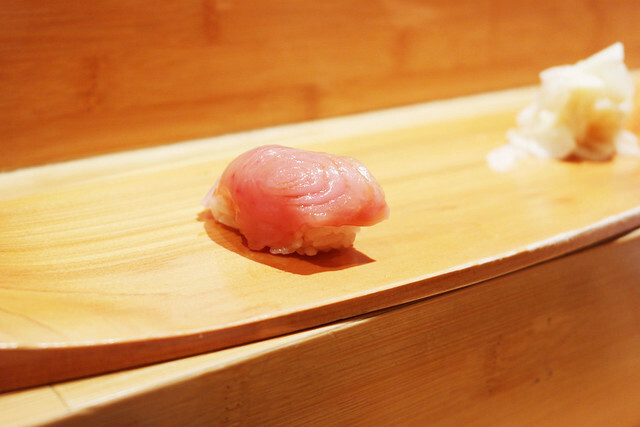 Sometimes you come across the best mot juste for a food, and toro is no exception. When I think of fatty tuna, I think of all of its fatty goodness melting against the warmth of my palate, and this toro did just that, too. It was super melty and a tad stringy from the fattier areas of the fish. 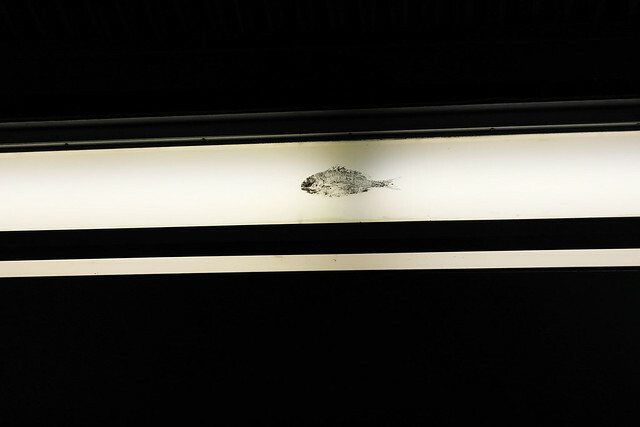 This could be the one piece of fish that could turn a bad day completely around. It's a delicious celebration in your mouth! Then we had the Spanish mackerel which I noted simply as "AWESOME!" (which I believe were Marcus's words) in my notes I jotted during dinner. Not too fishy as mackerel usually is, making it different from others I've had before. 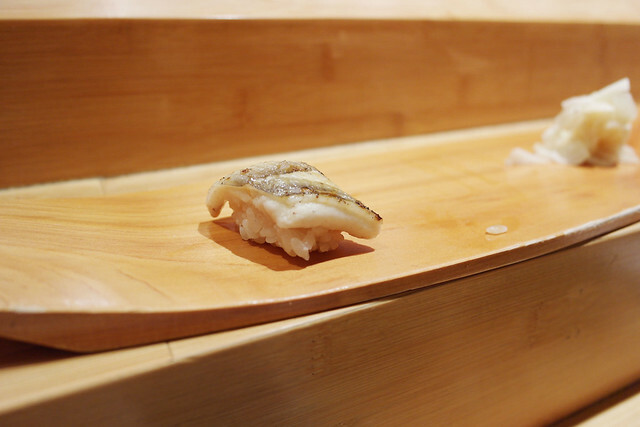 Here, we tried our second variety of eel -- this time it was the sawani (white sea eel) which had been grilled with a thin glaze of sake and some sea salt, resulting in a toasty exterior and a soft, flaky center. It was not as dressed up as the unagi, which I preferred so that the eel could speak its true flavors. 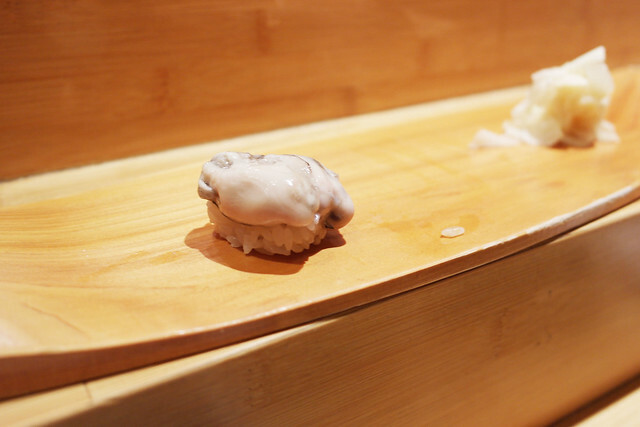 Who knew the ideal preparation of eel could be such an art form? Simply beautiful. Next we had the oyster (from British Columbia), which had a light sprinkling of lemon zest. It was meaty and creamy all at once, starting boldly with some sweet brine, finishing a little bitter. Marcus, who isn't normally a fan of oysters, wasn't any further convinced to like oysters, but I enjoyed it. The last mackerel of the evening for us was saba (mackerel), which had the best balance of fishiness and savoriness one could hope for without being overwhelmed or turned off. My last piece (number 16!) 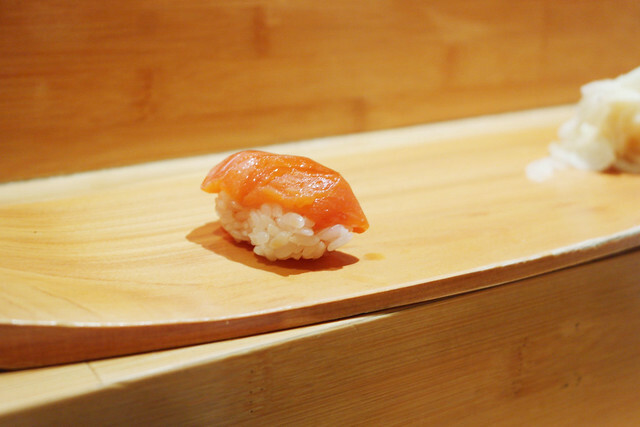 of my omakase was the white king salmon. It was another variety I'd never had before, and it was a really nice piece of fish -- tasted like a marriage between a white fish and salmon. It was a light yet satisfying ending to the progression of the previous 15 pieces, for sure! Marcus's last piece (in lieu of the uni I had) was the shrimp, a fileted piece that was flash-grilled to maintain the essential flavor of the shrimp -- an enjoyable end for Marcus as well. Findings: Sushi Yasuda is just as I remembered it -- an understated gallery of beautiful pieces of fish, which range with many varieties in the major families of fish (e.g., salmon/trout, tuna, white fish, mackerel, etc.). As the interiors and the demeanor of its sushi chefs suggest, Sushi Yasuda is a Zen-inspired sushi house where the main focus is the art of sushi at hand. 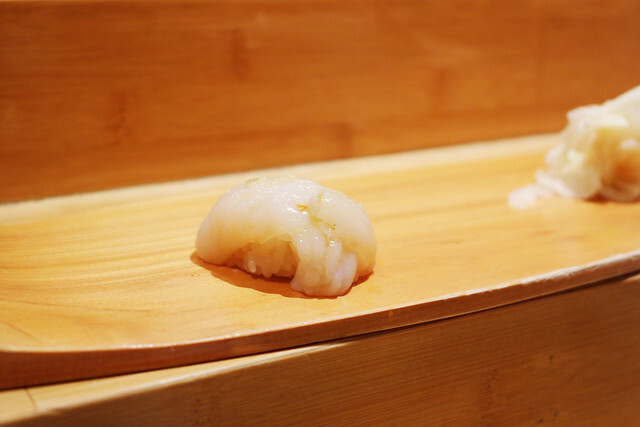 Much care is taken into the preparation of rice, the selection of fish, the garnishing of shoyu and wasabi, the progression of omakase tailored to each patron individually, and the overall happiness of the restaurant's guests. Everything is understated so that the real showstopper can show its vibrant colors as you pop pieces onto your palate. 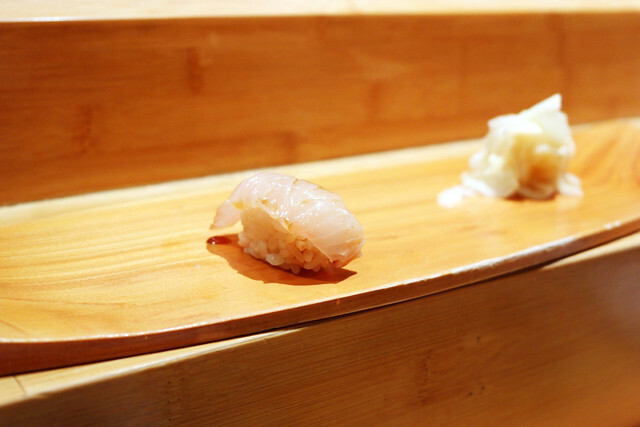 It is a symphony of savoriness and a proper ode to the Japanese art form of sushi-making. Be sure to make reservations up to four weeks out (at the sushi bar if you can for the optimal experience), and note that meal durations are clocked at an hour and a half (e.g., a 7:30 reservation ends at 9, etc.). 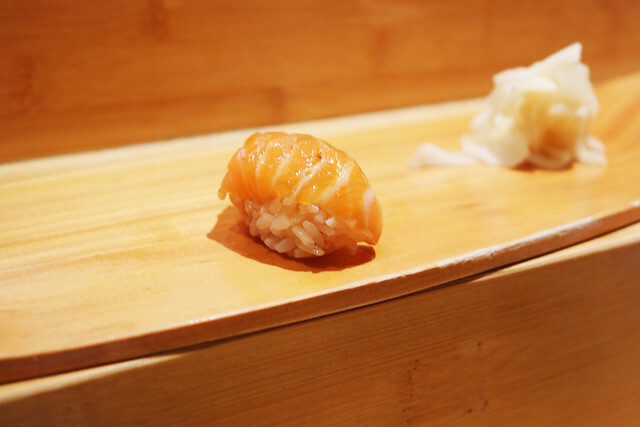 Also know that you don't need to opt for the omakase (though I really strongly urge that you do!) but rather can order a la carte by marking up the boxes next to the varieties of fish on the sushi menu to indicate how many pieces you wish to have. 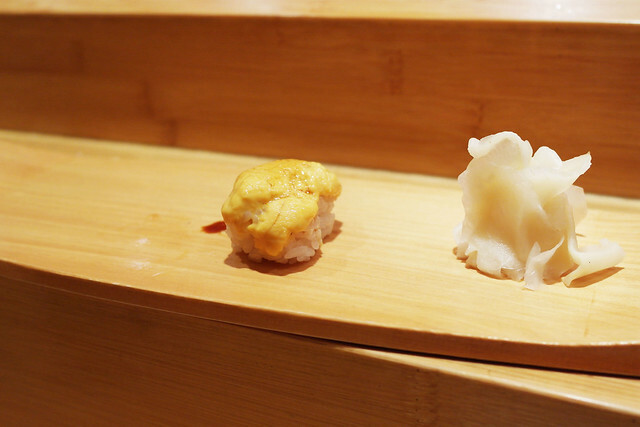 So if you're looking for a high-end sushi bar in this city -- no gimmicks, just great quality, very purist sushi -- Sushi Yasuda is the place, hands down. Happy Birthday to Marcus -- glad we were able to celebrate at Sushi Yasuda with some amazing sushi! :) Love you!! Price point: ~$110 per person for a sushi omakase of 16 pieces each.